Bollinger County is a county located in Southeast Missouri in the United States. The county seat is Marble Hill. The county was officially organized in 1851. 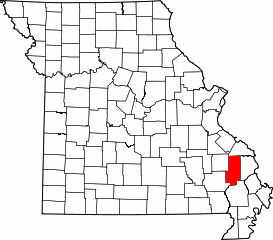 Cemeteries of Bollinger County, Missouri are located across the county. Listed here are cemetery records that have been published online. Bollinger County is the home of the Missouri dinosaur and Blue Pond, the deepest natural pond in Missouri, is located in the southern portion of the county. According to the U.S. Census Bureau, Bollinger County has a total area of 621 square miles (1,608.4 km2), of which 0.07% is water. For more cemetery records, visit our sister website, Interment.net. Copyright © 2013, Clear Digital Media, Inc.